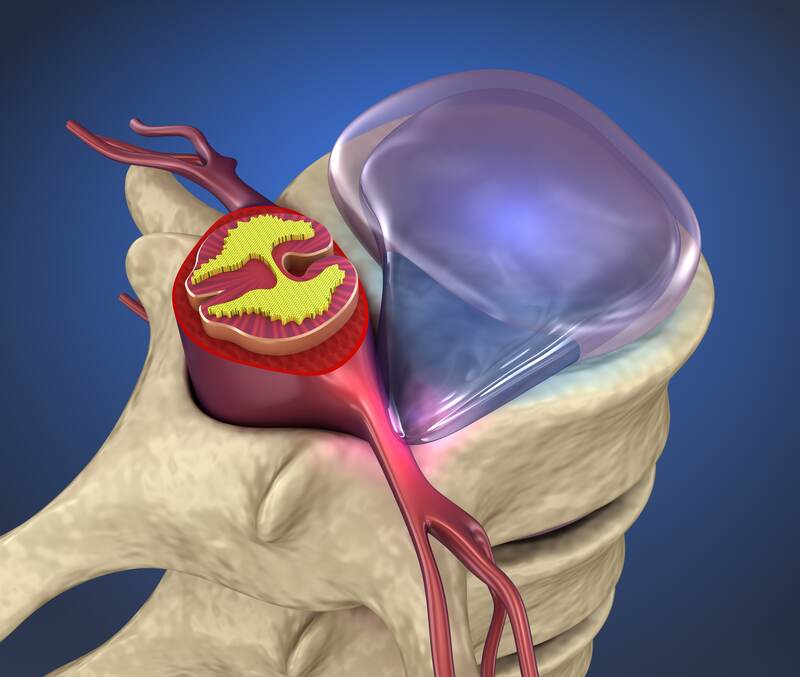 Spinal disc herniation, also known as a slipped disc, is a medical condition affecting the spine in which a tear in the outer, fibrous ring of an inter-vertebral disc allows the soft, central portion to bulge out beyond the damaged outer rings. Symptoms of a herniated disc can vary depending on the location of the herniation and the types of soft tissue that become involved. pain that will radiate into the regions served by affected nerve roots that are irritated or impinged by the herniated material. undefined pains in the thighs, knees or feet. If the herniated disc is in the lumbar region the patient may also experience, pain usually continuous or at least is continuous in a specific position of the body. Ayurveda categorized Slip disc-Grudrasi as one of diseases caused by vitiation Vata (one of the principle dosha in the body, responsible for the movement and functionality of the body). Treatment in Ayurveda is aimed at restoring the equilibrium through correction of the underlying functional in-equilibrium. Ayurvedic treatments for Slip disc concentrate on bringing back the aggravated vata to the state of equilibrium and thereby to the state of health. In Ayurveda we are providing very effective and most successful treatment for Slip disc or herniated disc(Grudrasi). With our vast experience in treating Spine related conditions, today we are successfully dealing even post surgical recurrence cases. The treatment comprises of Detoxification and rejuvenation through Ayurvedic Panchakarma therapy, administration of researched medicines internally.The therapies like Abyanga swedam, Nasyam, Pathrapotala swedam, Choornapinda swedam, Pizhichil, Shirodhara, Kadeevasthy, Greevavasthy, Navarakizhi, Vasti etc. are done as per the necessity and condition. These therapies are directed towards relieving the inflammatory changes, releasing the spasms and nerve compressions in the affected area, strengthening the supportive tissues holding the spine, nourishing the joints through improving the circulation. Usually the treatment period is 2 – 3 weeks according to the severity of the diseases.